TriMet’s Center Street Bus Maintenance Garage was recently recognized by the City of Portland Bureau of Environmental Services (BES) for successfully meeting all permit requirements for wastewater pretreatment, marking the 13th consecutive year the garage has received this award. Wastewater pretreatment reduces the amount of pollutants and neutralizes wastewater to meet discharge requirements. Types of pretreatment include pH neutralization, solids separation, metals removal and oil/water separation. Treating wastewater before it leaves each site reduces wear and maintenance on critical infrastructure and reduces operating costs at treatment plants. The Center Street Garage maintains an industrial pretreatment wastewater permit that is issued and monitored by BES. The Bureau issues permits to industries or agencies based on their wastewater characteristics or amount of discharge. The permits require agencies to monitor for pollutants of concern and to comply with reporting schedules, along with general conditions listed in the permit. Wastewater at Center Street Garage includes sanitary lines, bus wash, steambay and shop floor wastewater. This permit requires TriMet to clean, maintain, sample and meet certain treatment requirements before discharging wastewater to the municipal sewer system. Additionally, BES staff collects and analyzes samples and conducts site inspections to confirm permit compliance. 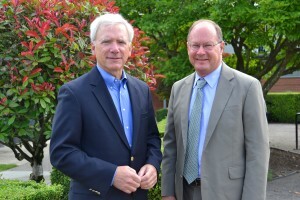 On June 6, 2013, TriMet and other industrial award winners were recognized at ceremony hosted by BES Director Dean Marriott, Pollution Prevention Services Manager Marveita Redding and the Industrial Pretreatment program staff. 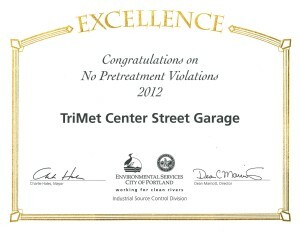 TriMet’s Center Street Maintenance Garage is the only TriMet facility that requires a wastewater permit from BES. 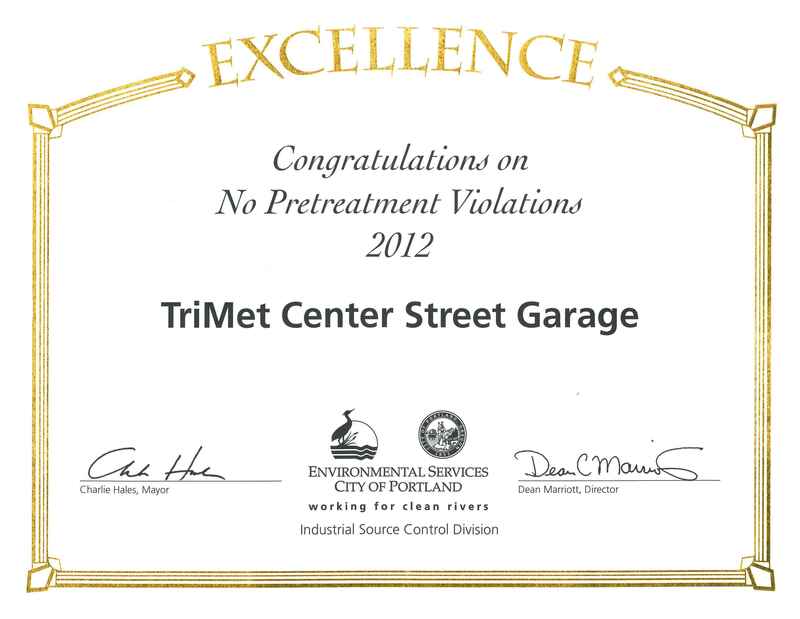 TriMet’s Powell Garage had a BES wastewater pretreatment permit and won the same award in years past but no longer requires the permit. The Powell Garage now has a Best Management Practices (BMP) certification, which details the preventative maintenance done to ensure our wastewater meets discharge requirements. This certification does not have the sampling associated with Center Garage’s permit. The Merlo Garage has a wash water discharge permit, administered through Washington County’s Clean Water Services. This permit also requires BMPs to be followed, in particular separating sediment and oil from wastewater before discharging to the sewer system. Clean Water Services conducts annual inspections of the garage facilities though there is no sampling required for this permit. Merlo has a new bus wash and fuel facility and they are in excellent working condition thanks to the hard working facilities staff. The Elmonica Rail Garage follows a similar permit to the Merlo Garage. It is also administered by Washington County’s Clean Water Services and is inspected annually. Ruby Junction Rail Garage does not have a wastewater permit due to the low discharge volumes. Best management practices are in place at Ruby Junction.